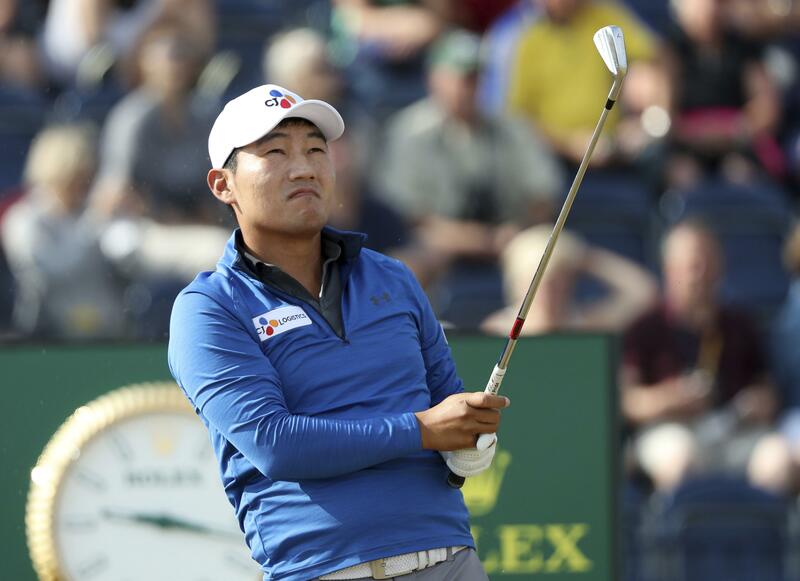 UPDATED: Thu., July 19, 2018, 5:25 p.m.
CARNOUSTIE, Scotland – Sung Kang doesn’t plan to handle rulings any differently because he doesn’t think he did anything wrong when fellow PGA Tour player and Clarkson-native Joel Dahmen accused him of taking a bad drop three weeks ago. Kang and Dahmen were playing in the final round at the Quicken Loans National when Kang’s second shot to the par-5 10th went into a hazard. Kang took a drop near the green. Dahmen contended the ball crossed the hazard much farther back, and without video evidence, the rules official sided with the player. Kang earned a spot with room to spare in the British Open that week. He opened with a 69 on Thursday and was asked about the incident after his round. Kang says he initially was upset, but now feels the more he talks about it, the worse it gets and it will only hurt his game. But there were more questions. And he kept talking. He says he tried to talk with Dahmen at the John Deere Classic last week, but it was right before their separate tee times, and he didn’t want either of them to be distracted before playing. A group of seven Americans (and two fiancees) are sharing a house again, a “tradition” that began at Royal Troon a few years ago. And apparently, they now have World Cup fever. Kevin Kisner is among the group and says they spend part of their evenings playing soccer. Jason Dufner is the goalie. “I just try to smash Duf in the face,” Kisner said. The others are Jordan Spieth, Justin Thomas, Rickie Fowler, Jimmy Walker and Zach Johnson. Spieth is said to have some ability. “Until he sends it over the goal four houses over, and we’ve got to go knock on neighbors’ doors for the soccer ball,” Kisner said. Johnson said he was a left forward when he played in high school in Cedar Rapids, Iowa, and had a good left foot. He also confirmed that Jordan Pickford, England’s goalie, is not under any threat. “Duf has some bruises,” Johnson said. Russell Knox says what most players probably feel: The first time playing with Tiger Woods is not an ordinary round. Knox, who opened with a 73 after three-putting the 18th hole, described Woods as a his hero from having grown up watching him dominate. Knox said he felt good on the course except that he had too much tension in his swing. “First round with Tiger, obviously I expected to feel a little bit different,” he said. Knox first met Woods a few years ago while they were in the bathroom, so there wasn’t much time to talk. They met again in December 2016 in the Bahamas at the Hero World Challenge, though there were 16 other players at a party hosted by Justin Rose. On this day, he had nearly five hours with Woods and Hideki Matsuyama during the opening round of a major. He also was trying to beat him, if not just Thursday for the whole week. He feels that way about every player. Sergio Garcia never considered his drive on the 465-yard 10th hole would tumble into the Barry Burn in front of the green. The only good news was the water was shallow enough for him to play the shot. The Barry Burn first comes into play on the 10th hole. It more famously crosses the fairway on the 18th hole. That’s where Jean Van de Velde was when he threw away the Open in 1999. Padraig Harrington went into it twice in 2007 when he lost a one-shot lead to Garcia before beating him in a playoff. Neither could play out of the water. With the water shallow, Garcia made it look easy. Matthew Southgate of England opened with a 69 and felt he did the locals proud. His father is a member at Carnoustie, and he gave Southgate a membership for his 16th birthday. … There were eight rounds in the 80s, including former Open champions Darren Clarke and David Duval. … Ten players failed to make a birdie, including Ernie Els, who still managed a 73. … Adam Scott had a local caddie at Shinnecock Hills. This week he is using Fanny Sunesson, who used to caddie for Nick Faldo. Published: July 19, 2018, 5:09 p.m. Updated: July 19, 2018, 5:25 p.m.